This week, Mercatus Center Senior Research Fellow Veronique de Rugy uses data from the Congressional Budget Office (CBO) to examine the estimated growth in spending without and with a potential Budget Control Act (BCA) sequester. As the chart and the accompanying data show, the purported spending “cuts” arising from the sequester are merely reductions in the overall growth of spending, not actual cuts that would address and relieve the United States’ debt problems. The sequester is an automatic budget enforcement mechanism triggered when the Joint Select Committee on Deficit Reduction fails to enact legislation to reduce the deficit by $1.2 trillion over the sequestration period. Instead of simply passing appropriated funds to the agencies, the U.S. Treasury “sequesters” the difference between the cap set in the BCA and the amount appropriated. Changes in spending from sequestration result in new budget projections below the CBO’s baseline projection of spending based on current law. The federal government would spend $3.62 trillion in the first year with sequestration versus the $3.69 trillion projected by CBO. By 2021, the government would spend $5.26 trillion versus the $5.41 trillion projected. Overall, without a sequester, federal spending would increase $1.7 trillion (blue line). Overall, without a sequester, federal spending would increase $1.80 trillion (blue line). With a sequester, federal spending would increase by $1.65 trillion (red line). A further breakdown of the percentage of budget programs reveals that sequestration provides relatively small reductions in spending rates across the board. With sequestration, defense increases 15% (vs. 23%); nondefense discretionary increases 6% (vs. 12%); Medicare increases 62% (vs. 74%); and net interest increases 160% (vs. 179%). Veronique de Rugy talks about the feasibility of sequestration and historical spending reductions at National Review Online’s The Corner. 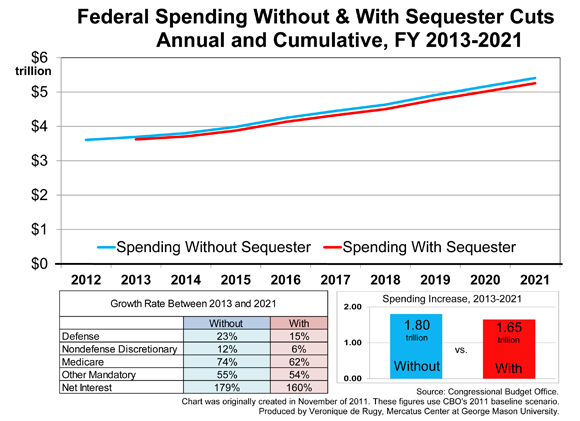 At The Washington Post, opinion writer George Will uses this chart to examine spending increases with and without the budget sequester. What Happens if the U.S. Super Committee on Deficit Reduction Fails?